This is a Standard Employment Agreement Template that may be applicable in all states, though consultation with an attorney is advised. This agreement is between an Employer and an Employee. The Terms and Conditions of the Employment have been outlined in the agreement, as well as the responsibilities of the employee. The company is employing the employee subject to him abiding by the terms and conditions that have been set in this agreement. The Board of Directors and/or the management of the company will decide on the employee’s title, duties, work hours and responsibilities. And the employee will have the specified title initially. The company will take care the during the term of this agreement the employee will not be required to undertake any duties that would make him/her more out of their current residence. The employee will be given a full compensation for the services he/she provides under this agreement, the sign the lease shall be set from time to time by the company the employee will receive any other benefits for which he/she is eligible under the terms and conditions of this agreement, the company will provide the employee 14 days’ vacation per year of work. The company will provide the employee advance payment from time to time for any business related expenses incurred by the. The employee will have to submit a weekly itemised expense account data as required by the company to substantiate the advance payment. All the records and any information leading to the company is the sole property of the company even if it is the result of services provided by the. The employee is free to leave his job any time upon giving sufficient notice to the company. The same applies for the company wanting to terminate the employment at any time. As long as the employee is working at the company he/she will not engage in any business that is in direct competition with his current employer, call on or solicit any client or customer of the employee, revealed confidential information the company to any individual, partnership, company, or association apart from the company. 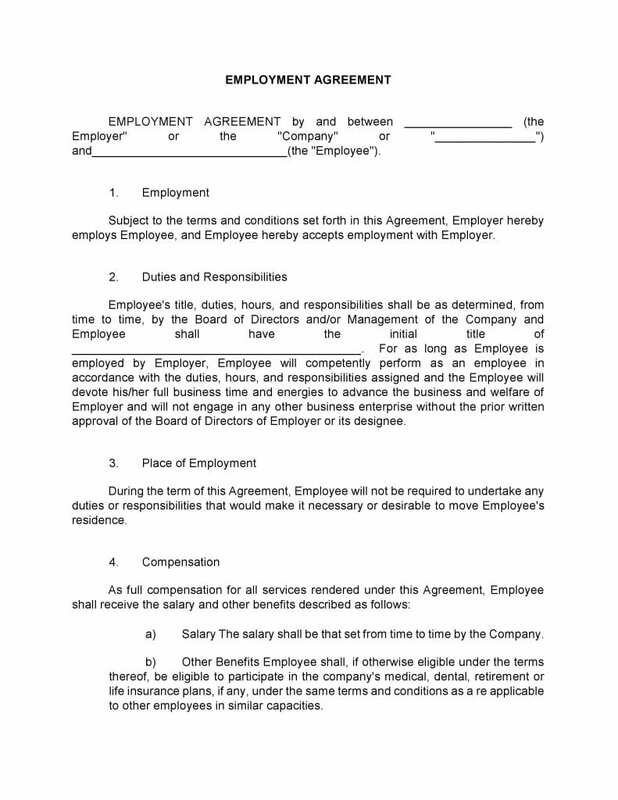 The rest of this standard employment agreement template contains terms and conditions about any inventions and the original works created by the employee during his employment, assigning of his employment to any of the successor, any other amendment or integration of a new term and condition to this document. Do not forget to seek proper legal advice in case you have any problems in understanding this agreement. You can download this template by clicking on the link below.